Andinet Meaza was born in southwestern Ethiopia, in a small town called Chencha. Today he works to provide food, jobs, market and distribution for Ethiopia’s hope crop, apples. For five years he served as Committee Secretary for the Chencha Highland Fruit Cooperative. Cooperatives are the main channels for marketing and distribution for small-holder farmers in Ethiopia. Two years ago, Andinet founded another cooperative, known as “Rehobot”, so that he could more effectively work within the apple market. Andinet has become a major player in the Addis Ababa apple market. 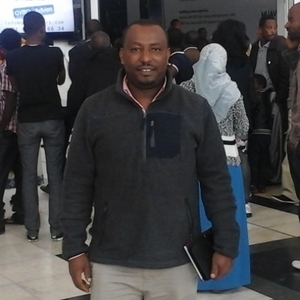 Since 2011, he has worked strategically to market premium fruits to major customers within Addis Ababa. He distributes apples to embassies, major hotel chains, as well as individual sales from his own small shop. Andinet is an Ethiopian. He’s doing a lot of great work, he’s an entrepreneur. He’s growing apples, bringing a new crop and a new process to the Ethiopian world. He’s partnered with the government and with local communities, different religions and he’s put in place many things from an entrepreneurial standpoint in an agricultural standpoint that are bringing hope to a lot of people in Ethiopia. Question 1: So Andinet, what is your favorite quote about hope or your favorite comment or statement about hope? How do you describe hope? Hope is a big issue in human lives and I will say from my perspective, hope is expecting good to happen to you. Just looking at a bright future, beautiful things to happen or I would say in other ways dreaming good things to happen in your life. Is there a word for hope in your native language? What language do you speak natively? My native language is the national language, Amharic. The word which we have for hope is “Tasfa”. In my native language, Gamo, my mother tongue, it’s Ofaysa. The word you grew up saying, if you grew up saying that word, how would you explain it to me? As I said, when we Ethiopians say tesfa, which means hope in English, you are expecting something which is good to happen to you. That or in another way, if you lose something, you think that I will get something – expecting something to you. That should not be negative. If it’s negative, we don’t say its hope. But if it’s positive and its good and what you desire, then you say that’s my hope. That’s my tesfa. Question 2: Who’s been a person in your life that shared a lot of hope with you in the past? Who’s given you hope? For me I would say maybe it’s difficult to say specifically to this point, but I would say different people. Since I’m a Christian guy, I grew up in a Christian family, I would say number one is Jesus for me. Jesus really is the one who makes me to be full of hope. In another way, I would say most of the time when I read the bible I get hope and certainly I would say some friend and some people in history. Their examples let me have hope in my life. I would say my mom and my dad too because they are not from a Christian family, but when I hear their histories, what happened to their lives, when they tell us as a son or as a child, we really get hope that that something that happened in their lives makes us hopeful. Did you get me? Great stories. Thank you Andinet for giving us your time. I’m really curious about your place in the world because we all come from different circumstances and different geographic locations. You’re in Ethiopia, so a very different world than I grew up and I’m sure in a different world than our listeners in the United Kingdom and our listeners in the Philippines and in Saudi Arabia. I’m sure very different stories as well. Question 3: When you were growing up or in your past, when is a time when you really had to lean on hope and really believe “this is going to get better” because things might have been really hard? Have you had any times like that? As you have said, since you are living in Africa, you have a great question of can I really have hope to be a rich guy or a hope to be a ghost from the books of poverty? To me because I grew up in middle, in the context of status in Ethiopia, sometimes you see that people really think that they are really tied with poverty until they’re dead. Many times it makes a question to me and in my life to say, really, can I get out of poverty in my life? But, thanks to God, I’m really pushing ahead and trying to get hope. I remember a family issue. My older and my dad, they fought with one guy and they just put them in prison. Those are the times that really I lost my hope thinking that my dad and my older brother will stay many years in prison. But finally, thanks to God, really God intervened in the issue and my dad and my older brother didn’t stay long in prison. They came out of prison maybe in 10 days. That’s how I have seen hope and God in my life. Sometimes even in my real life, I dream something and I plan something and I try to do it, but sometimes you see that hope is breaking down and I see that after two days or a week or months, it becomes real and happens in real life. I think you’re making a good point. Some things happen to people around us or family member that we can’t control that we hope sometimes it will get better and sometimes they do and sometimes they don’t and then there’s things that happen that we dream about and hope that will happen, but it just doesn’t seem to happen the way we think it’s going to or fast enough. What are the things in Ethiopia that are causing people to be hopeless or what are people hoping in in your area? For Christians and for some people, I think I would say we see hope because we depend on God and we from the church’s side, we see a great change. The church is going to change the country. Are there a lot of group like this around that are bringing hope into communities? Yes. Really for sure. For example, my brother’s organization, Erasmus, or people like the missionaries, they’re really bringing the change because you see, these projects, they’re really changing the living system, the economic system, the financial system of the people. Question 4: How are you using hope today? What are you doing in your community to bring hope to people around you? I would say the first thing in my community, even the controllably acceptable is to share your life experience to people and other people’s. For example, if you see some people who have really, really lost their hope and have gotten back hope in a while, if you share that one – for example let me say, to one of my friend or to other friends, I would say take me for example. I was in such situations, I was in such difficulties, but look at me today. Because I prayed and I worked on it, I did get success. If you share your life experience and other’s life experience, then they will be more hopeful. So just by being a friend to people. In just hearing somebody like you talk who’s got a lot of life experience that I don’t have, with things that I’ll probably never experience is really helpful because if you get really down and you’re hopeless sometimes, you wonder, is there anything there that I can really hang on to or you wonder, if I am holding on to something and hoping for something that can happen in the future, am I just doing that in my own little world and something that really wouldn’t last? Getting outside of our own community or own experiences to places that other humans are experiencing really helps us know what is it that works for all humanity, not just my little pocket of humanity here in my town. You’re sharing hope, I know, in a way that’s really unique in Ethiopia. So, tell me a little about the apple orchard and how you got into it. What are you doing? Apple is a tremendous tree in Ethiopia. We say, even to many people, an apple a day keeps the doctor away. That’s really making a great change. I would say that in Amharic. [Speaks in Amharic] That is having an apple a day for a better life or better health we say it. So, as I said, it’s because of the church. The church has a development wing to work on it besides spiritual work. So, the church prayed on the issue and God gave a vision of apples to share to the people, to the nonbelievers, to the believers. So, they started an apple orchard center and started to share, to give to the people and started to find apple markets at the town especially with the missionaries from the outside, especially the German guy. He really helps us a lot and that’s how we became apple sellers. Now we are producing many, many apple. You got a direction that you wanted to go to in your community that would let you provide apples, health food, and financial provision there as well because people can buy them and sell them. There’s market made there. You are able to bring in a product from the outside that wasn’t grown in your area and now you’re building a farm literally. Is that right? So you can offer jobs, you can offer food and this is not just people in the churches. Anybody in the community. I’m sure other places as well are involved in this, right? Yes, definitely. It’s basically church, but now it’s exploring even to the whole community, even to the whole country. Even the government now, just clearly we are distributing – I would say maybe, let me think, it’s about 10 years ago we distributed more than 100,000 apple seedlings all over Ethiopia. Can you believe that? The government is involved with you as well? They’re supporting it and one of your partners, right? Yes. That’s why the government organizes cooperatives so that we can have an easy market for the farmers and the believers. I think it’s great that you can even bring the communities that believe differently. Sometimes we believe differently than our governments and that’s true in every country in the world and it’s great to see somebody like you who is able to actually connect to the community, to the government and to different belief systems and share it that way. I’m impressed. Question 5: Andinet, if I’m struggling with hope and I need to grow in hope and pursue something that’s more positive for my life or my community, what simple step would you give me? What would you say I should do first? How would I start? The big point you raised here is, I would say before you share to somebody hope, you have to be a man of hope. Did you get me? So before I could share hope, I have to be a man of hope? Yes. The one who shares hope must be a man who has hope in himself. If not, you can’t share hope to me. So as I said before, being a friend to somebody, with a neighbor or in local and market. Let’s just be a friend on the way, on bus and everything. If you just become a friend, then you can just tell him many things about hope. So to me, the first step to begin with is to just have intimate or close relationship with some guy and you have to be hopeful man to give some hope for others. I think that makes a lot of sense. So, you have to be a man of hope or a woman of hope yourself. You have to have hope inside you to begin with and then to share it, you have to become friends with somebody. I think that’s so important because so many people try to just go out and tell another person what they should do. They might not have a friendship or relationship with that person. They just want to tell them something. You have to be friends and intimate relationships first. That’s a great point. You just kind of raised a point here. Because I work in a small business like a mini market here in the capital, Addis, many people, they come to me and they try to consult me about business, small business and the good thing I have seen in my life is that I don’t just go and tell the theory of business, but I just give them two or three examples in my life to show them that there is challenge in business, to show them that there is hope in business. So, when you just tell them the way you crossed or passed through, they really understand them, they really get hope that they will be profitable and successful in their businesses. Especially in our culture, in Ethiopia, if you are an example to people, people get really excited of you and they follow your steps. That’s why I say if you are doing something what you say, the people follow you. If you are a man or a woman of hope, then people will follow your step and become a man or woman of hope. In that, you are a great man of hope. I’m really privilege to talk to you. Tell me the things that you’re doing there right now. You’re talking a lot about hope. You’re seeing it and it started taking shape in your life and in your family’s life. I ask this every time we get done. Do you listen to music? Is there something that you love to play and listen to when you’re thinking through, I need to feel just a little better today. I got to play something that makes me smile. You know as Christians, we only listen in Ethiopia, Christian music, Christian songs. In the church, some Christian musicians, they just make Christian music, so we sing it in churches, everyone. I always listen to that. It’s really touched my heart. That really is great. Do you have a favorite artist that you listen to over there or favorite Christian producer who’s making the music you want to listen to? Yes. Right now she’s living in the states. She’s a Christian lady. Here name is Lily Kalkidan. She’s my favorite Christian singer. Many, many songs that really touched my heart, especially I would say – can I sing that one? [Andinet sings Christian song] It goes like this, I will interpret for you. “What makes me rejoiceful man, what makes me a hopeful man, that’s because I have Jesus, the son of God. Nothing amazes me, that’s just only Jesus.” That’s the main message. Awesome. Thank you so much for singing. You have a beautiful voice. Great voice. Thank you for the hopeful message in it as well. If the apples don’t work out, you got a second career there. I love it. You’ve been fun to talk to and it’s so great to see a piece of your world and your hope. Thank you for sharing hope with me and so many others today. Chris I will say, as a Christian brother, thank you very much for the wonderful work you are doing. I really appreciate your work and I really love to have contact with you and one day I hope that we will see each other. You will see amazing things in Ethiopia. I would love to do that and I sure hope you get to make it to the US as well because there’s a few amazing things over here to see that I could show you.